"The fundamental education is the science of the consciousness; it is the science that allows us to discover our relationship with human beings, nature, and all things." - Samael Aun Weor The problems afflicting society today are firmly rooted in the modern approach to education, which focuses on memorization and imitation rather than genuine understanding and practical importance. Schools, teachers, and parents emphasize what we should think, rather than teaching how to think, to question, analyze, and discover the truth through our own experience. The modern system demands that students follow what they are told, and not to question what is taught. From the perspective of the ancient Gnostic tradition, beneficial growth for an individual or a society is an outcome of comprehension: knowing the truth through experience, rather than because of what someone else has said. History shows that those who are willing to question and analyze are those who arrive at the most useful and important knowledge for the benefit of everyone. This includes spirituality: the greatest spiritual leaders refused to follow the established "rules," and instead followed the guidance of awakened consciousness, thereby showing humanity the way to the Light. Over his lifetime, Samael Aun Weor taught millions of people how to awaken consciousness and free themselves of suffering. 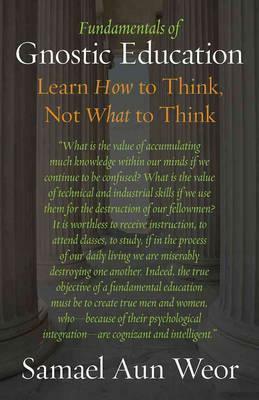 This book radiates his brilliant teaching method, a beautiful reflection of the same approach utilized by our most important sages, philosophers, and thinkers, which is a form of superior logic and tremendous love that illustrates how vital it is for people to learn not "what to think, but HOW to think." By awakening the consciousness and developing the heart and mind in equilibrium comes the potential to alter the painful realities that humanity is suffering within. Perhaps his most quotable book, it provides a solid and ethical foundation for students, teachers of any kind, and parents.